Previous PostPrevious What is Patina? We are delighted present this stunning set of four Georgian Hall chairs, in the manner of Gillows. The arched backs have carved paterae and painted recessed panels. The moulded seats below are raised on turned reeded legs. They are a rare design, of refined elegance and handsome proportions, and it is not hard to imagine them in the large hallway of a grand house. And the big house that they originated from in this case was Gargrave Hall, Yorkshire, seat of the Coulthurst family during the late 18th and 19th century. 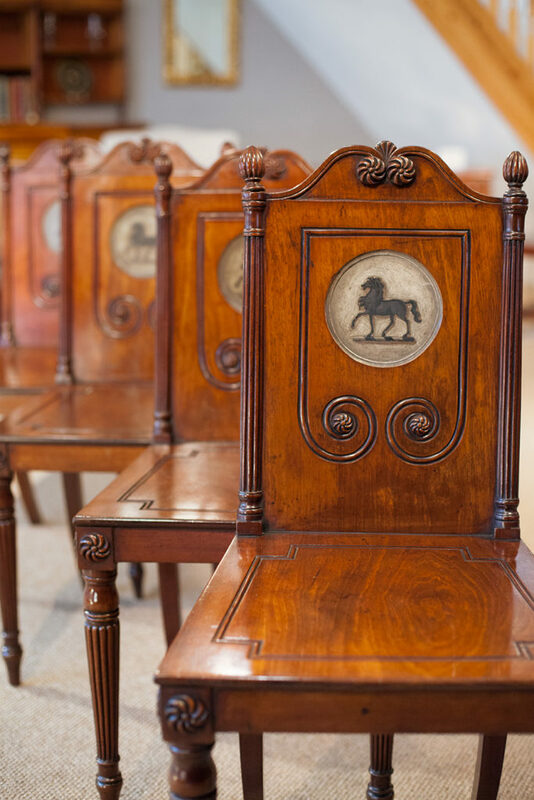 Although occasionally hall chairs were painted with the family crest, in this case we have inset panels painted with equine crests. In heraldry the horse is a symbol of speed, intellect and virility and is said to signify readiness to act for one’s country. Once a staple feature of stately homes throughout the 18th and 19th centuries, hall chairs occupied a prominent position in the home’s entryway. Placed to accommodate guests entering the home before they were invited into the more intimate inner rooms, they also provided a discreet resting place for waiting servants, the solid upright back prevented slouching!